Rev. Marion H. Price, Sr. Celebrating the life of Rev. Marion H. Price, Sr.
Be the first to share your favorite memory, photo or story of Rev. Marion. This memorial page is dedicated for family, friends and future generations to celebrate the life of their loved one. Obituary for Rev. Marion H. Price, Sr.
Rev. 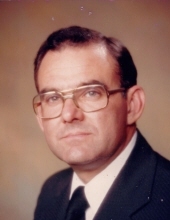 Marion H. Price, Sr., 80, of Hogansville, passed away Tuesday, February 5, 2019, at his home. Rev. Price was born June 11, 1938, in Atlanta, son of the late Rev. George Gordon Price and Elizabeth King Price. A veteran of service in the U. S. Navy during the Cuban Missile Crisis, he served as a crew chief on P2V Neptune maritime patrol aircraft. He attended Georgia Tech, was employed as a draftsman and import/export materials inspector, and was an ordained minister for fifty years. During the years 1997 until 2013, he traveled to Malawi, Africa to serve on 19 mission trips. Survivors include his daughter, Leigh Ann Olson-Bullock and her husband, Frank Bullock of Grantville; sons, Marion Price, Jr of Hogansville, Paul Price of Clearwater, FL, Steve and Julie Price of Hogansville, Bryan and Kim Price of Pell City, AL, John and Angie Price of Newnan; 19 grandchildren; 15 great-grandchildren; and a great-great-grandson. He was preceded in death by his wife, Shirley Haney Price; daughter, Susan Price Burnham; grandson, Steven Myles Price, Jr.; and sister, Sarah Elizabeth Price. The funeral service will be conducted at 1:00 p.m., Saturday, February 9, at Welcome All Baptist Church in Hogansville. Dr. Tommy McLeroy and Dr. Bob Doom will officiate and interment will be in Myrtle Hill Cemetery. The family will receive friends at the funeral home from 6 until 8 Friday night. To send flowers or a remembrance gift to the family of Rev. Marion H. Price, Sr., please visit our Tribute Store. "Email Address" would like to share the life celebration of Rev. Marion H. Price, Sr.. Click on the "link" to go to share a favorite memory or leave a condolence message for the family.